Just here for the night – walking up and down this yere ole alley, thinking of you. When I’m in Chicago for a right while I’ll look you up. If you’re ever in our town give me a “ring.” $1.00 down bal. on delivery. – B. The meaning of this postcard remains a secret between the sender and the recipient. 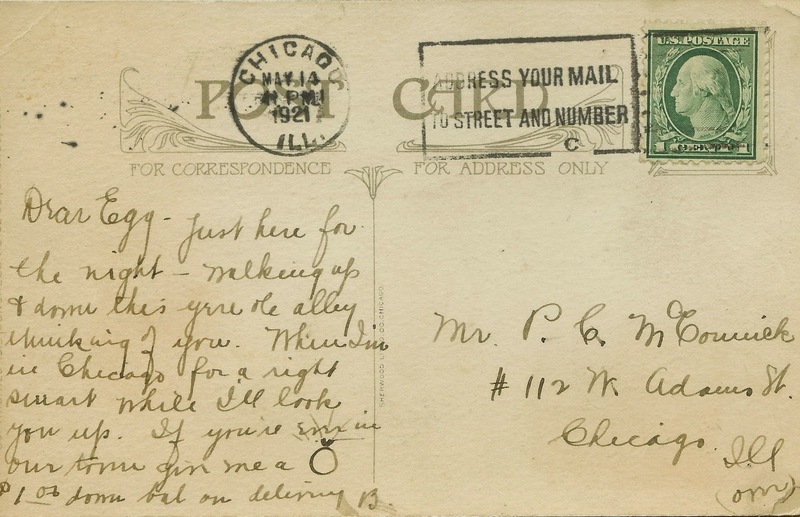 Based on the postmark, though, Benita clearly was in Chicago, her hometown, when she wrote this. “Egg” was Phillip Columbus McCormick. He had, in fact already given Benita a “ring,” all right. A wedding ring. If you’ve been reading this blog regularly, you already know my great-aunt Detty, or Benita McGinnis, fairly well. You’ve learned she was an outgoing, larger-than-life Ohio native who moved with her family to Chicago, Illinois, at the turn of the 19th/20th century, studied art there and in Paris, had her first serious relationship in Ireland that later left her with a broken heart, and was chief of the motion picture Censor Board in Chicago. While Phillip Columbus McCormick was certainly Benita’s opposite in temperament and ambition, he proved able to hold his own and then some. Born on October 24, 1892, in Camden Township, Minnesota, he was one of eight children born to Patrick McCormick and the former Margaret Craven. When he was about four years old, the family moved about miles away to the town of Hopkins, where Patrick McCormick was appointed postmaster. On June 5, 1917, two months after the United States entered World War I in Europe, Phil registered for the newly created Selective Service. At age 24, he was one of many young American men ages 21 – 31 years who did so on that very same day. He was working as a freight service agent in Saint Paul, Minnesota, for the Baltimore and Ohio Railroad, also known as the B & O. He was called up a year later and served in the United States Army for about nine months. He never went overseas, serving most of his term in Washington State, where he worked his way up the ranks to the title of sergeant. 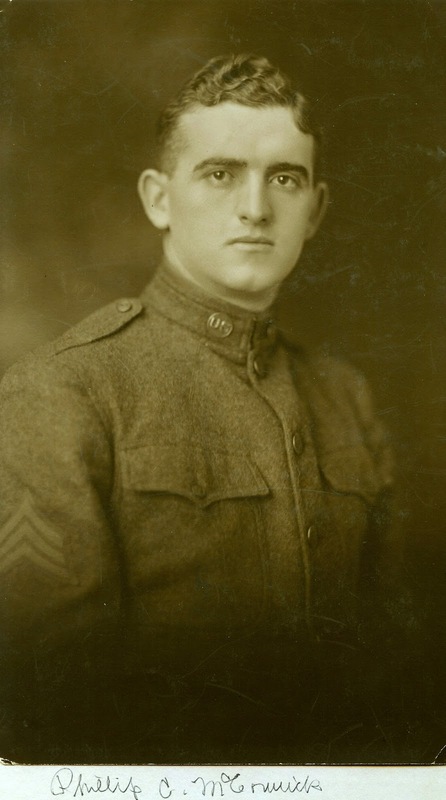 Upon his discharge at Christmastime in 1918, Phil returned to work for the B & O, this time as an assistant general freight manager in Chicago. While living there, Phillip and Benita were introduced by a mutual friend named George Butcher. She decided her sister (my grandmother) Alice would like him, and arranged for them to meet. It turned out the entire boisterous McGinnis clan liked him, especially Tom and Janie McGinnis, Benita and Alice’s parents. Whenever he visited the McGinnis home, he was well-mannered, responsible, and respectful of both their daughters. Though from a large family himself, he was quiet and modest, the perfect complement to a family of unique and sometimes competitive individuals who were used to lively conversations around the dinner table. Tom was pleased that Phil was a fellow railroad man and a hard worker. As he had worked on the Nickel Plate Railroad in Conneaut, Ohio, some years before, he and Phil probably got along famously, comparing notes about railroad service and the changing industry. Benita’s younger brothers Eugene and John enjoyed Phil’s easygoing personality and dry sense of humor. John especially enjoyed talking to Phil about history and his own experiences in the Great War as a cavalryman. He became a regular visitor to the McGinnis household. Fascinating people, and Phillip is a handsome devil! The little coincidences of life…! Thank you, Ellie! He was as handsome as he was kind. He and my aunt will always have a special place in my heart. It sure is a keeper, Brandy!